Freedom Rockz: Free @ Monterey Bay! So Cool! Free @ Monterey Bay! So Cool! Watch the Beach Live! So Cool! Let the kiddies watch the animals on live cams @ Monterey Bay Aquarium. 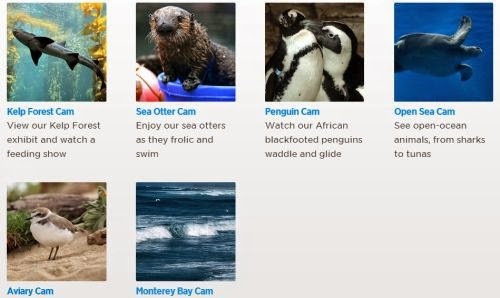 Chose from the Aviary Cam, Monterey Bay Cam, Open Sea Cam, Penguin Cam, Sea Otter Cam or the Kelp Forest Cam. Click the link below to chose which cam you want to watch live! Don't forget to turn your speakers up & listen to the soothing sounds of the beach & also they have educational speakers while you watch the fish etc. This is so cool! Love it! Thanks again Dallas you ROCK!